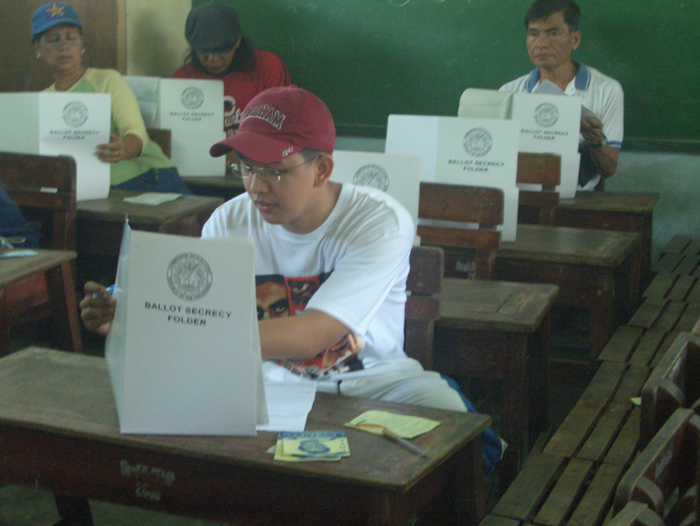 MANILA, Philippines – There are less business contributors in the upcoming elections than the last presidential race. Businessmen are also less keen in donating to multiple candidates. These are findings based on the Social Weather Stations (SWS) 2009 Surveys of Enterprises in Corruption presented at the Asian Institute of Management, Friday. “There are fewer business contributors now than in the 2004 elections,” said SWS President Mahar Mangahas. When asked the question, “For the 2010 election campaign, do you think that the typical company in your sector of business will donate,” 68% answered that they will not. In the 2004 elections, only 54% said that they will not be donors. Some 550 business managers from the National Capital Region, Davao, Cagayan de Oro, Cavite Laguna and Batangas were respondents in the survey which was conducted from November 3 to December 5, 2009. Of that number, 184 are from large business corporations. The rest are managers of small-medium scale businesses. The survey has margin of error of +/- 4%. Right after the 1998 elections, scuttlebutt has it that two months into Erap’s term, election contributions kept pouring in. The donors made a beeline at the Polk’s, the well-known residence of the newly minted President. Some visitors were first time donors bent on making an impression on the new Chief Executive, while the rest were original patrons who made sure that they were never forgotten by bringing in some more. At the end of the confusing weekend of victory parties, the new Malacanang tenant was a billionaire ten times fold. Not to be branded as a cheapskate, he called on his favourite local leaders, foremost among whom were the governors of provinces where Erap prevailed, and the sunshine was spread. One of the recipients was the ex-Quezon governor who received quite a handsome amount of P20M balato. With his secret billions stashed somewhere sourced from political contributions and the rest skimmed from gambling lords, Erap maintains his innocence that he never stole from the public coffers. After filing her CoC in December, 2010, Miriam Santiago was saddled by a disqualification case. One issue, among many others, raised by the protester before the Comelec, was the failure of the feisty senator to report to the poll body the amount of the election contributions she received right after the 1992 presidential elections. Soon enough, the former trial court judge was able to acquire multi-million residential house at La Vista in QC, a well-appointed enclave of the rich sandwiched by UP and the Ateneo. Just how much she received from her patrons who were encouraged by the early surveys topping the roost of presidential bets in 1992 was a mystery to this day. She even was able to post the obligatory bond of several millions in her electoral protest against FVR only to be abandoned in 1995 when she clinched her first term as senator. To this day, bad blood between her and FVR and his minions simmers when the occasion presents itself. Jose Pidal was the depositor of billions of campaign contributions of GMA. Many willing donors balked after it was revealed in a Senate hearing that the Arroyo family after all secreted the bulk of the contributions in the mysterious bank account of Ignacio Arroyo, the brother-in-law of GMA. Of course the rigmarole is too apparent. In order to steer clear of further Senate inquiry the family dropped the Right to Privacy bogey and enjoyed their trip all the way to the banks. Who provides all these billions in campaign donations? The typical Chinese merchant. Post War World II, we saw presidents getting elected every four years. A presidential election then was one big national cockfight. Wagers were collected in the form of campaign donations. The Chinese merchant of Binondo must have a stake in the electoral contest or he risked the harassment of City Hall. Every presidential candidate had to go the rounds of the Chinese community and in no uncertain terms announce his intentions. From Roxas to Macapagal and Marcos, these former presidents had in their memoirs how was it to be lauriated by the grovelling Chinese businessmen. The last of these breed was Ferdinand Marcos. Marcos knew the Chinese merchant like the back of his hand. This type of businessman did not have passable accounting records. Reports on income or local taxes were prepared by a non-CPA holding office in one seedy office space in Yenco Building along Sto. Cristo. They were the favourite targets of the Dirty Dozen of the late Misael Vera, of the Bureau of Internal Revenue. Tax audit reports were disposed of in the Pasig River never to be resurrected again. The thieving dozen became so notorious, and of course spectacularly rich, that Marcos invented the term “notoriously undesirable” in booting out these rascals from the BIR. The constitutional innocence presumption went out of the window when Marcos relied on anecdotal evidence in firing these rogues from the tax agency. But like the starfish, the dirty dozen regenerated right after the Edsa revolution because Marcos failed to seize their assets. They transformed themselves as crusaders opposed to dictatorship. With their assets intact, they reconfigured themselves thanks to the unfettered media (and the mushrooming p.r. outfits) right after Edsa 1. One of them even became the treasurer of a major party and went on to redeem his swagger in Greenbelt. Lucio Tan is Exhibit A as the typical Chinese entrepreneur bamboozled by the tax man. From his humble beginning, the Kapitan has grown into a billionaire in these parts. There’s no denying that he used his access to Marcos towards the advancement of his manufacturing empire. Twenty-five years into post Edsa revolt, he is still hounded by the PCGG, a government agency tasked in the recovery of ill-gotten wealth. Imelda Marcos and her family hang by the neck of the china man. How many millions has he shelled out from 1965 when Marcos first ran for the Presidency? In 1992, he openly rooted for Ramon Mitra, the most organized presidential bet propped up by the ubiquitous Laban ng Demokratikong Pilipino. Fortune’s 18-wheelers with Mitra ang Matibay tarpaulins crisscrossed the archipelago bringing in the logistics enough to conquer Malacanang. FVR upon swearing in, sicced Liwayway Chato against the Kapitan for all imaginable breaches of the tax code. Of course Tan has the means to deflect all these harassments and aided by a well-connected counsellor. But the anxiety and the anguish were all too etched on his face. Again, El Kapitan plunked in more in Jose Pidal’s kitty in 2004 as insurance for a benign treatment under GMA watch only to be told that his billions were allegedly corralled in Iggy Arroyo’s bank account. It turned out we bankrolled the GMA run against FPJ as shown by the Bolante scandal. For the unused donations, the Kapitan could not ask for a refund. SEC. 240. Special Levy by Local Government Units. – A province, city or municipality may impose a special levy on the lands comprised within its territorial jurisdiction specially benefited by public works projects or improvements funded by the local government unit concerned: Provided, however, That the special levy shall not exceed sixty percent (60%) of the actual cost of such projects and improvements, including the costs of acquiring land and such other real property in connection therewith: Provided, further, That the special levy shall not apply to lands exempt from basic real property tax and the remainder of the land portions of which have been donated to the local government unit concerned for the construction of such projects or improvements (LGC). SEC. 241. Ordinance Imposing a Special Levy. – A tax ordinance imposing a special levy shall describe with reasonable accuracy the nature, extent, and location of the public works projects or improvements to be undertaken, state the estimated cost thereof, specify the metes and bounds by monuments and lines and the number of annual installments for the payment of the special levy which in no case shall be less than five (5) nor more than ten (10) years. The sanggunian concerned shall not be obliged, in the apportionment and computation of the special levy, to establish a uniform percentage of all lands subject to the payment of the tax for the entire district, but it may fix different rates for different parts or sections thereof, depending on whether such land is more or less benefited by the proposed work. Without the ordinance, Villar’s real estate companies won’t receive any written notice of assessment of the special levy. Without the special levy, he can unilaterally dictate the price per square meter of his properties. There is nothing noble in his protestations that the government has not settled with him yet and therefore he is at the losing end of the bargain. It looks like his monumental ad expenses came from his tubong lugaw brought about by his rerouted Dang Hari. It looks like the Chinese community won’t budge in the contribution department. They want to know how much Villar would bleed and for how long. William Gatchalian is Exhibit B. Dante Tan is Exhibit C.
WG was a willing banker of the Erap run. By all indications, he pledged all his worldly belongings to hitch the Erap bandwagon. He was successful. But the unravelling Erap Presidency saw the profligacy of it all. Not only was he ignored for his expensive investment in the Erap campaign, he was used by Erap in his attempt to wriggle out of the impeachment complaint that the Metrobank account was not Erap’s but that of Dante Tan of Best World Resources and the money deposited was WG’s. But these gentlemen have grown wiser. WG has his family well-entrenched politically in Valenzuela City since 2001 when his son Sherwin first got elected as 1st District congressman and later City Mayor in 2004-2010. Rexlon, a younger son is the sitting 1st District congressman. These siblings are not the breed Gov. Grace Padaca advocated to be unmasked in Isabela or Vice Mayor Ismael Mangudadatu sought to be clobbered in Maguindanao. The Gatchalian brothers seem to be qualified for the job having graduated from some Ivy League schools in the US. The young congressman Rexlon has made himself visible in the Manny Villar campaign. There is no doubt the patriarch feels a notch above the rest of his golfing pals in Wack Wack. With these two sons holding elective positions, WG has so far saved, from 2001, hundreds of millions of pesos while at the same time enhancing their business empire in the country. The Kapitan, in retrospect has learnt all the lessons there is. No more election aid. Her daughter can be somebody someday in politics. Maybe he’s into something in this country’s history as he learnt it. Just like his business gut call, he seems to be sure of her candidacy.